The weather alert system WIND (Weather Information on Demand) is an information service that warns the user of local extreme weather events. Users can configure the system online so that it meets their requirements and can determine the warning area (county, postcode, or geographic coordinates) and the information channel (SMS, email, or fax) themselves. Thanks to its prompt warnings, WIND makes it possible to take protective measures in the event of extreme weather and to prevent damage to people and property. The system has been operational since 2003 and is now one of the biggest private weather alert systems in Europe. WIND allows to adjust settings such as type of storm, degree of severity, receiving device, position of the user and warning period to the specific requirement of individual persons or whole user groups. Information on the storm, such as its strength, position and direction are calculated using precise, radar-based processes. 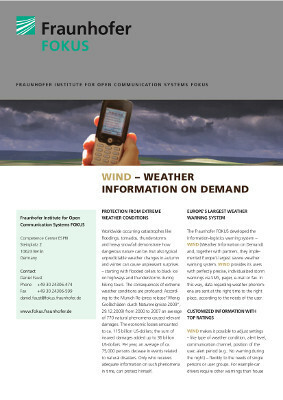 In several studies of private customers and communities on behalf of the German insurance companies, the service from WIND was awarded an average grade of approximately 1.5 [equivalent to A-] in the school grading system.